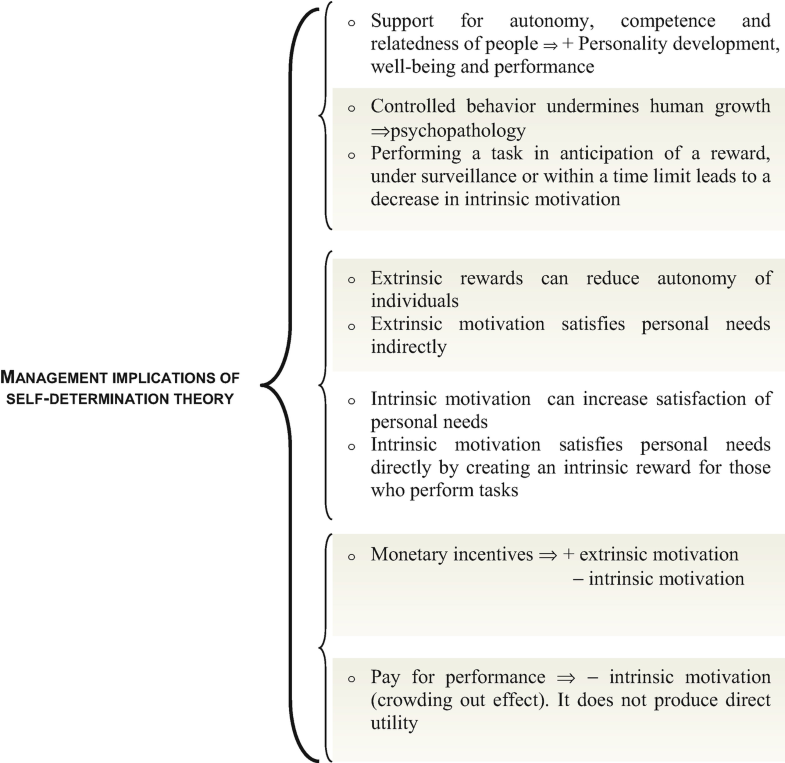 Self-determination Theory explains the factors of intrinsic motivation (autonomy, competence, and relatedness) and of extrinsic motivation (internalization and integration) that support personality development and behavioral self-regulation to improve personal wellbeing and performance of people in organizations and society. In order to explain self-determination theory, it is important to clarify the concept of motivation that originates from Latin word movere = “to move.” The study of motivation focuses on factors that incite resources of a person to achieve goals and support rational choices in organizations and society. Scholars have developed different approaches to analyze and foster motivation in organizations (Mullins 1999). The early theories of motivation are based on hedonism by Locke, Bentham, etc. : individuals behave in a manner to maximize pleasure and minimize displeasure. The theories of motivation in management from 1910s to 1960s are affected by Frederick Taylor with the approach of scientific management and by Douglas McGregor with the human relations movement. Taylor’s approach is directed to maximize labor efficiency of employees, which are motivated by more than money. Recent studies suggest that employees have a variety of needs, such as security, social fulfillment, and challenging job. In this research field, Douglas McGregor advanced two beliefs about human behavior: Theory X and Theory Y. Theory X has the following assumptions: (1) average human being has dislike of work; (2) people have to be coerced, controlled, and threatened with punishment to achieve goals; (3) average human being has little ambition. Theory X was a widely accepted managerial approach prior to the human relations movement (Ivancevich et al. 1977). Theory Y, by contrast, considers: (1) commitment to objectives is a function of rewards associated with their achievement; (2) average human being learns; (3) people can exercise self-direction and self-control to achieve goals; finally, (4) intellectual potential of the average human being is only partially utilized (cf., Ivancevich et al. 1977). Contemporary theories of motivation have two directions: content and process theories. Content theories of individual motivation identify people’s needs, their relative strengths, the goals they pursue to satisfy these needs, etc. Main content theories are: Maslow’s hierarchy of needs model; Alderfer’s modified need hierarchy model; Herzbers’s two-factor theory; and McClelland’s achievement motivation theory (Mullins 1999). Process theories of motivation focus on work-related factors that arouse employees to motivated behavior. Main process theories are: expectancy-based models by Vroom, Porter and Lawler; equity theory by Adams; goal theory by Locke and also the attribution theory by Heidler and Kelley (Mullins 1999). Managers can apply these different theories to support specific situations and/or organizations. In this context, Self-Determination Theory (SDT) is a broad theoretical framework for the study of human motivation and personality in organizations and society (Deci and Ryan 2004; Ryan and Deci 2000). In fact, humanity has curious, vital, and self-motivated people that are inspired, striving to learn, wish to extend themselves, master new skill, and apply their talents responsibly (Ryan and Deci 2000; Deci and Ryan 2004). Next sections explain the characteristics of this general theoretical framework of SDT. SDT analyzes the factors of human motivation and personality with a metatheory that highlights the importance of humans’ evolved inner resources for personality development and behavioral self-regulation of people in organizations (Deci 1980; Deci and Ryan 2004; Ryan et al. 1997). In general, human nature has the natural tendency to seek out novelty and challenges, to extend and exercise one’s capacities, to explore, and to learn. In this context, the domain of SDT is the investigation of people’s inherent growth tendencies and innate psychological needs that are the basis for self-motivation and personality integration. In particular, SDT focuses on positive developmental tendencies, and social environments that are antagonistic towards these tendencies, to explain factors that support or undermine self-motivation, social functioning, and personal well-being. SDT begins with an analysis of the determinants of intrinsic motivation and human tendency towards learning and creativity that support motivation, performance, and well-being of people in organizations, competition and society (Baard et al. 2004; Coccia 2014; Coccia and Cadario 2014; Coccia and Rolfo 2013). As a matter of fact, intrinsic motivation exists in the job itself and gives personal satisfaction to individuals, such as autonomy, recognition, expense preference (e.g., leeway to invest monetary resources), trust, and empowerment (Benati and Coccia 2018; Coccia 2019, 2001). Especially, intrinsic motivation describes the natural inclination towards assimilation, mastery, spontaneous interest, and exploration that are essential factors to cognitive and social development for enjoyment and vitality throughout life of people (Ryan et al. 1997; Coccia 2019). O’Reilly et al. (1991) have suggested that intrinsic motivation may be more important for affective commitment and job involvement within organizations. SDT is based on a subtheory called by Deci and Ryan (1985) cognitive evaluation theory (CET) that has the aim of specifying factors that explain intrinsic motivation. In particular, CET is framed in terms of social and environmental factors that facilitate intrinsic motivation versus factors that undermine it. CET also specifies that feelings of competence will not enhance intrinsic motivation unless accompanied by a sense of autonomy. Within SDT, autonomy is not to being independent, detached, or selfish but rather it is associated with the feeling of volition that can accompany any act, whether dependent or independent, collectivist or individualist. Studies show that autonomy supportive parents, rather than controlling parents, have children who are more intrinsically motivated (Grolnick et al. 1997). Autonomy and competence support intrinsic motivation in association with a third vital factor that is relatedness. According to CET, social environment can facilitate intrinsic motivation and people will be intrinsically motivated only for activities that hold intrinsic interest for them and that have the appeal of novelty and challenge. SDT also suggests that the basic needs for competence, autonomy, and relatedness must be satisfied across the life span for an individual to experience an ongoing sense of integrity and well-being (Ryan and Frederick 1997). Moreover, SDT suggests that the failure of supporting competence, autonomy, relatedness (not only of children but also of students, employees, patients, athletes, socializing agents, etc. ), it can generate the possible effect of alienation and ill-being of individuals in society. Within SDT, Deci and Ryan (1985) introduced a second subtheory, called organismic integration theory (OIT), to detail the different forms of extrinsic motivation and contextual factors that either promote or hinder internalization and integration of the regulation of behaviors. Fig. 1 illustrates the OIT taxonomy of motivational types, arranged from left to right in terms of the degree to which the motivations emanate from the self (i.e., they are self-determined). Internalization refers to people’s taking in a value or regulation, whereas integration refers to the transformation of regulation into their own that, as a consequence, it will emanate from their sense of self. SDT recognizes that extrinsically motivated actions can also become self-determined. In fact, individuals, with internalization and integration, can be extrinsically motivated and committed. These types of motivation are: external motivation triggered by outside rewards and punishments; introjected motivation based on internal rewards and punishments, such as guilt and self-esteem; identified motivation based on consistency with one’s system of values; and integrated motivation based on assimilation into one’s system of values (Ryan and Deci 2000). SDT claims that conditions supportive of autonomy and competence can facilitate human growth tendency, whereas conditions of controlled behavior can undermine its expression. Baard et al. (2004) show that on the one hand, employees’ experiences of the satisfaction of needs for autonomy, competence, and relatedness in the workplace support performance and well-being at work; on the other hand, excessive control and lack of connectedness can disrupt organizational learning, reducing initiative and responsibility, and also generating distress and psychopathology of individuals (cf., Coccia 2001; Coccia and Cadario 2014; see Fig. 2). Experimental research inspired by self-determination theory suggests that monetary incentives generate two opposite effects: (a) they enhance extrinsic motivation (the price effect); (b) they threaten the need for autonomy, competence, and relatedness, lowering intrinsic motivation – the crowding-out effect. Self-determination theory suggests that extrinsic rewards can be demotivating and dissatisfying to individuals (Deci and Ryan 1985). In particular, extrinsic rewards and motivations can undermine perceived autonomy because they have a negative effect on intrinsic interest in a task or job (Deci 1975). Moreover, goals for financial success can undermine well-being, because these goals represent a controlled orientation that interferes with the fulfillment of more enduring needs, such as self-acceptance or affiliation. Self-determination theory also suggests that performing a task in anticipation of a reward, under surveillance, or within a time limit, it can decrease intrinsic motivation (Deci et al. 1999). 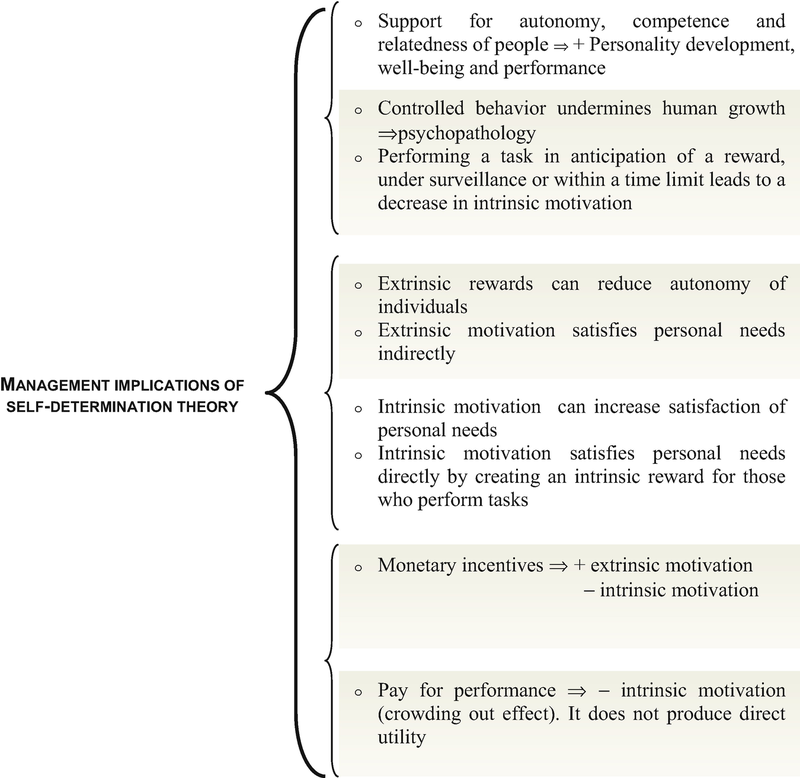 In addition, self-determination theory argues that positive feedback, salary, unexpected bonus, competence, and personal growth do not undermine intrinsic motivation, but performance contingent rewards do (Deci et al. 1999). In fact, intrinsic motivation, under certain conditions, can be undermined by pay for performance: giving someone a performance-contingent monetary incentive to do something they already enjoy, it can decrease motivation to do it because the person can view its action as externally driven rather than as internally appealing. In short, extrinsic motivation satisfies personal needs indirectly, because it leads to separable outcomes, such as monetary compensation (Ryan and Deci 2000). In particular, money cannot produce direct utility, but it enables an individual to acquire desired products. Intrinsic motivation, by contrast, satisfies personal needs directly by creating an intrinsic reward for those who perform tasks. Hence, pay for performance can lead, under certain conditions, to a crowding-out effect on intrinsic motivation. For this reason, the performance of interesting tasks is likely to suffer in the presence of performance-related pay (Ryan and Deci 2000). The self-determination theory (SDT) assumes that individuals may derive utility from the activity itself (Deci 1975). SDT suggests that employees are intrinsically motivated if they perform tasks based on loyalty, an internalized sense of duty, and/or enjoyment. Autonomy and competence support intrinsic motivation in association with a third vital factor that is relatedness. These three elements support personality development and behavioral self-regulation, improving personal wellbeing and performance of people in organizations and society. These predictions of SDT are supported by numerous experiments and field studies in management and psychological economics. Overall, then, STD seems to be an appropriate theoretical framework for explaining and supporting motivation and satisfaction of people and for designing best practices directed to improve their behavior and performance in organizations and society. The Turkish Presidential Model: A Hybrid System?